It's that time of year, a time for family and sharing. We hope you all have a happy holiday season. This is the slow time of the year at Glen-L, so we will be doing catch up and filling "rush" orders for our customers. We wish you a merry Christmas, so please buy our beer. I tried to think of a way to work this idea into the WebLetter, but couldn't come up with anything... so, please buy our plans... epoxy...? I am in the process of updating our web pages (in ways you'll not be able to see), in order to make them more readable to the next generation of Internet access devices. With more than 6,000 pages, it will take a while. We did not have a WebLetter in November, in case you thought you missed it. With the colder weather, boatbuilding has slowed or stopped in many parts of the world, so we haven't been getting much feedback. Since you can't work on your boat, this may be a good time of year to sit down and write a story about your project to share with your fellow builders. And what about the lady who was going to write about her husband's project from her point of view? Thanks to Bret Bordner, Michelle Gillette, Ken Schott and the others who contributed to this WebLetter. It's a boat for kids, not big kids, but children kids, the type that enjoys fun on the water. Are there any that don't? Kids will enjoy propelling the boat themselves and the splash of the paddlewheels. Put one at each crank and watch the merry-go-round fun that is created when they don't synchronize the paddlewheel turning. And it's one the adults can't practically ride in; it's too small. Sorry Pop, this one is not for you. Ke-Pau is a simple boat to build. It's flat bottomed with vertical sides. 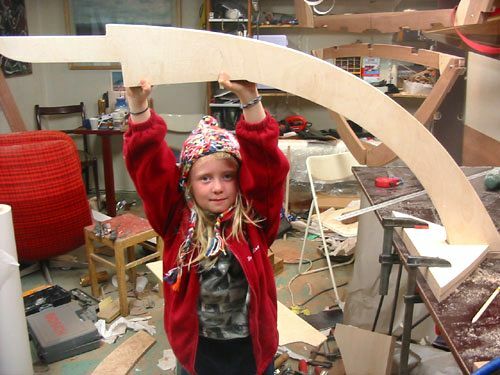 This eliminates any fairing or shaping; a project the kids can help with. Of course, helped and supervised by mom or pop, grandma or grandpa; even great grandparents. The Plans and Patterns are $35.00. For more information see the Ke-Pau design page. The effect of a good photo is amazing. Over the past year we have gotten several photos of the Malahini that have been given a classic mahogany runabout look with mahogany veneer over the plywood planking. As a result, the Malahini has become very popular. The Malahini is essentially the same hull as the Ski Tow; the difference being the spacing of the frames. Well, now we have received photographs of the Ski Tow from Mark Hudson. This hull has also been given the "mahogany" look. I anticipate a renewed interest in the Ski Tow as a result. The photos of the Two Plus sent by Kjetil Petersen have, likewise, sparked an increase in interest of the Two Plus plans. It is often difficult for potential builders to visualize the possibilities from the drawings and builder photos can be very inspiring. On the other end of the scale, we have no finished photos of the Dragonfly flats boat. This is a great design that meets a real need, it is built by the popular S&G method, but it hasn't taken off. I bet on this one, "this one will sell...". People just don't notice a design until they see a real photo. I am waiting for a photo of someone standing on the foredeck casting with a fly rod... this one will sell. I had just come home from the office. 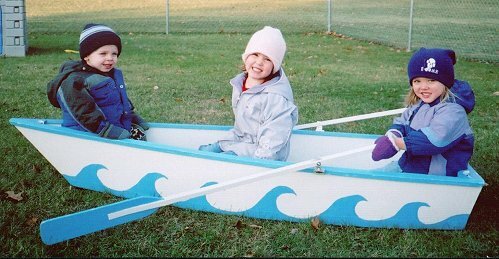 There I was, slumped in my easy chair looking forward to a relaxing evening in front of the television, when it happened… I'm not exactly sure when it reached the point of no return, but it started with a simple question from my #2 daughter: "Daddy, why can't I have a boat?" Now, Gayle is only five years old, so it did seem rather strange that such a question should come from her. 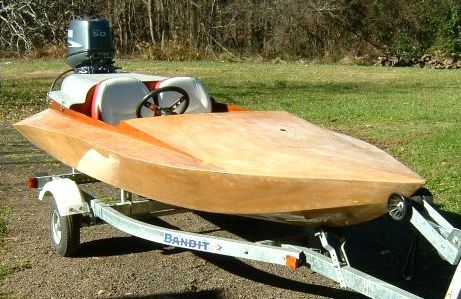 After all, being a practicing naval architect catering to the amateur builder, I always have a boat or two around, which we use for testing prototypes. My immediate thought was that somewhere in the neighborhood someone had bought or built a boat for his kids, so now WE had to have a certain type of boat as well! After all, you hafta keep up with the Jones', right? Not to mention everyone else in the neighborhood. Last year I sent you pictures of my son Ryan's Squirt and said that our goal for this summer would be to get the kids skiing behind it. Well, after a few problems with the motor I got all three of the kids (Jack 7, Ryan 9 & Alexa 12) to ski behind her. They are hooked on skiing now. Next year we'll work on Ryan pulling skiers, then it will be time for a bigger engine so they can ski on one ski. 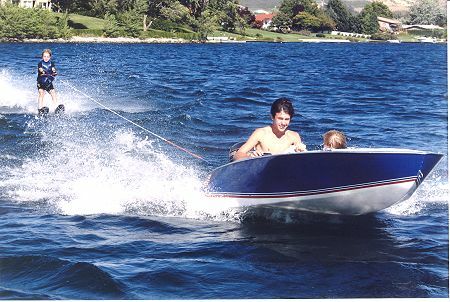 Squirt is a great boat that my kids can play in and learn the ways of the water, like I did when I was their age. Thanks again Glen-L for this design, I think next winter will be spent on Jack's Squirt (my 7 year old). Attached is a picture of Ryan skiing in rough water on Lake Chelan with my nephew driving and Jack spotting. We received a beautiful hand drawn Christmas card from Greg Seibel. I was really impressed with the intricate detail he drew into his "Glen-L" and want to share it with our readers. Call from David Routh in Phoenix, starting a PD Racer club in the Phoenix area. 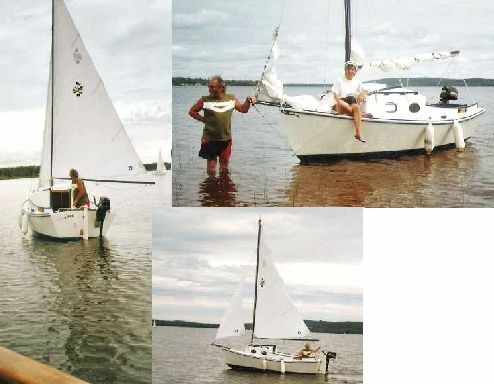 This is a sailboat class, a box with a rocker in the bottom, can have centerboard or daggerboard, any sail you want. For more information, see PDRacer.com. 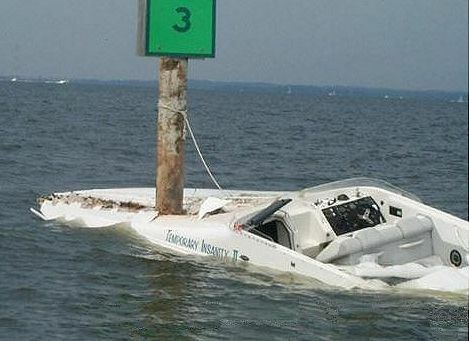 The driver may need to plead the name of the boat. "Okay kids, remember where we parked...."
We entered the Glen-L WebLetter in an Ezine Directory. This is supposed to bring more people to the site, don't know if this will mean that more people will build boats, but it's worth a try. If you would like to rate our WebLetter, please use the form below. 1 = Waste of cyber Space! While you're looking at the Boatbuilder Connection, I hope you will join in the conversation. There are some really neat people who regularly visit and contribute, people worth getting to know. For further info about veneering the transom see WebLetter 57. Allyn reported that in the November 30 edition of the CBS TV series "NCIS", there were some good shots of the sailboat agent Gibbs is building. I went to the show's website to see if there was a photo, but, alas, no. I did find the following under Character Profile. PSYCHOLOGICAL EVALUATION: Major issues with authority. In the past year alone subject has had confrontations with the FBI, CIA, DEA and just about every other Federal, Local, or foreign agency he has had contact with. Subject also appears to be woefully out of touch with popular culture... perhaps because he elects to spend all his free time hand carving a wooden boat in his basement. **Note: How he plans on removing the twenty-five foot boat through a six and a half by three-foot door is still unclear at this time. In case you do not understand our interest in this project, see WebLetter 49. TNT project started Jan 04; I used the frame kit, fastener kit, fiberglass and epoxies provided by your company. Found everything easy to work with and according to specs, however, epoxy pumps would have been a big help. The plans were complete and easy to follow. She is 12 ft in length. The transom height was increased to 21" and reinforced, additional knees added along with sheet aluminum. The longitudinals are mahogany, decking and bottom are constructed with marine 5 ply, cowling behind the seats 3/4" x 1/4" cedar strips (fiberglassed). The entire exterior area has been fiberglassed. A 12 gal gas tank was installed in the bow area. She has single cable steering. Full instrumentation: Volt meter, gas gauge, speedometer, and tach. She is powered by a new 50 hp Yamaha. All that has to to be done to complete this project is painting. Will send additional pictures when she is in the water. Thanks for a fun project! PS: I'm a 74 year old senior and building this boat has really helped make '04 a fun year! Kid Row lives!!!!! But, will it ever see water? I doubt it, since it wasn't intended to be seaworthy (although it is). Comments: Finished the 12' Canyak, great looking & great for flyfishing. Want to build Squirt, Zip, Malahini. As you can tell, classic mahogany speedboats are my favorites. Also want to build stitch & glue sailboats. I'm a lumber sales rep in Tacoma, Wash. Comments: Have never built a boat before but am keen to do so, for the satisfaction of building something of beauty and to make use of the lake system where I live. Comments: I was interested to look at your website and see the photo's of the Thunderbolt. Back in 1965 we built a Thunderbolt and at that stage was the only Thunderbolt in New Zealand. We had a lot of fun with her, boy did it turn some heads!!! We eventually sold her in the mid 70's and I understand she is still going. Please advise if you would like a photo of her as I could probably get one to send for your history book.